I’m going Paleo….no grains, legumes or dairy for me! Ugh….lots of “giving up” and things I knew I couldn’t commit to long term. Then I read the lovely Jen’s (@littlemissmocha) article about gaining in the New Year. Yep, she said that dirty word…..GAIN. No she’s not signed up to gain 20 pounds but she’s looking at what she can add to her life….like healthy fruits & veggies. Her thoughts really resonated with me. I usually eat pretty healthy but I don’t always get all the fruits and veggies I need. I decided to change that! Both Evan and I LOVE them and they have 5 servings (or more) of fruits and veggies! What a great way to start your day. If you eat more veggies later….GREAT! If not, you’re probably still okay. Here’s the recipe I use & it is Evan approved! He and I drink these every morning. Put the ingredients in your blender in this order. 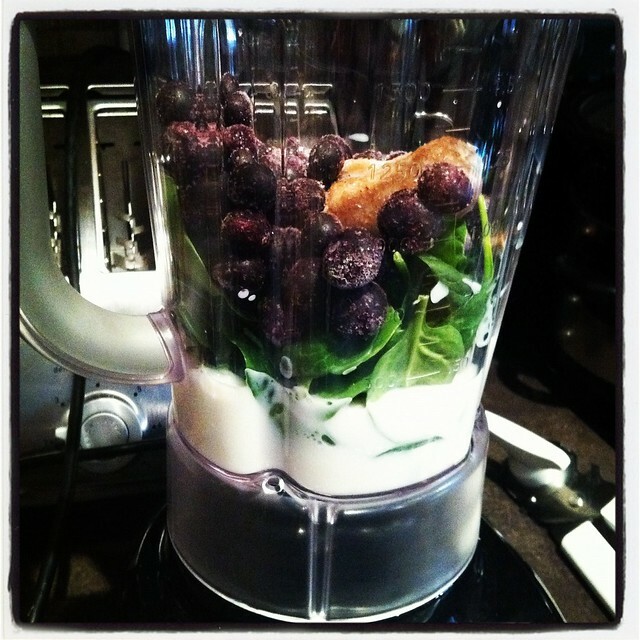 If you put the spinach last, it will fly all over the place and won’t get blended properly. Blend on the highest setting for about 1 minute. 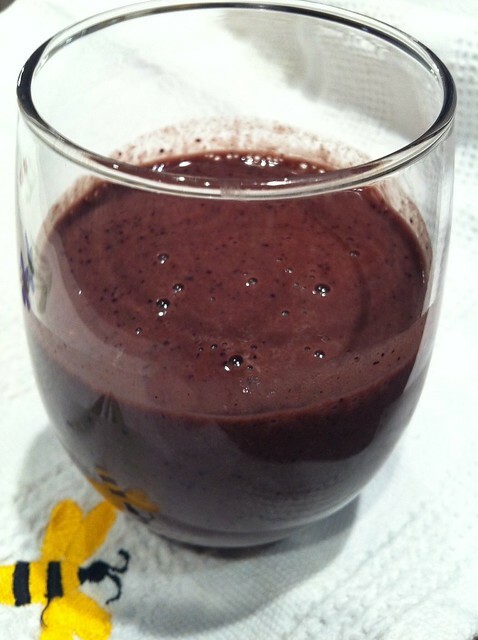 Recipe Notes: It will turn a great purple color if you use juice (and a more grey/purple color with milk) and your kids will never know there is spinach in there (you can’t taste it at all). In fact, Evan loves these smoothies & he knows there is spinach in them. This recipe makes enough for me to have a water bottle full of smoothie & Evan to have a medium glass full. You can also use frozen spinach. I bought frozen spinach in the bag & it comes in little bricks. Just throw them in the blender and blend like normal (you won’t need as much frozen spinach, though). I soooo hope that this will help me get well & stay well. What are you doing this January to get healthy? Frozen peas work great for this as well! 🙂 And avocados. I would never have thought of either of those. I’m trying to keep it relatively low cal so not sure about the avocados. I love them so if I’m going to eat them, I want to TASTE them. Thank you so much for the mention, and so glad you liked the post. That is EXACTLY my take on things – I can’t stand just doing without. I want to be adding so much good that I don’t have the time or craving for the things I should avoid. I’m starting a new project in a few days that is part of this too, to try to kick my sugar addiction. But again, not going to just quit eating it. Nope. I want to learn why I crave it, and what I can eat so I am not jonesing for it all the time. Posting about it tonight or tomorrow, woot! We love green smoothies, a new addition to our repertoire of snacks. I make them bright green and call them dinosaur smoothies, lol! ; ) Great post – we so need to share healthy things that work for our kids!! You’re very welcome. Thank you for your post! I love blueberries so I throw them in. I think Evan would drink them even if they’re green. Looks good, I’ll have to try that Merry! My hubby has a fruit and spinach smoothie every morning, and the kids have it on the weekend. They love it too! I have my beloved Chocolate Shakeology everyday and I also add flax seed to it! YUM. We were sick all the time last year, which I totally blame on 2 kids in preschool. The kids still get a few colds here and there, but I have been much better this year. I must have boosted my immune system last year with all those colds! I buy the frozen “fruit salad” mix at Costco or Superstore and add fresh spinach and water (especially if trying to avoid dairy). I also put in a couple packets of Stevia to sweeten it a little. My kids love it too! Using juice we don’t have to add any sugar. I’m going to start replacing some of the juice with water though to cut down on sugar. I tried the fruit salad mix once but I can’t stand grapes in smoothies. We love blueberries & they are SO healthy that I just can’t switch. I’m trying to “get healthy” – in all sense of the word – that is my challenge this year. I LOVE the “gain” theory though!!! We LOVE our green smoothies around here. Both of my kids love it and I’ve told them right from the start that there is spinach in them so they don’t know any better to turn up their noses at it. You are so right that order matters when putting the ingredients in the blender too! Have you tried Kale yet?! I’ve tried it once – not bad, not bad! Good to change it up a bit. I do kale..but if. Don’t have it in hand I like carrot juice, cranberries, strawberries which are frozen, and frozen blackberries if you have or blueberries, Greek yogurt, some flax ground, orange juice frozen concentrate…good. The other one that’s refreshing is pineapple, pink grapefruit a whole one, strawberries frozen, Greek yogurt.. Replacing pop with Perrier and wine and other alcohol with water….hut overall snacking and sugar has to get better….moving more etc. I have a workout buddy now and signed up for a aqua fit class and also started volunteering at our YMCA too a few months before Xmas. Oh I didn’t realize you could use the frozen bricks of spinach. That’s good info to have! I’m going to have to make these more often. Yep….they are the small bricks of spinach that come in a bag, though, not the huge ones.